Click on the above picture to go to the album. Well, it seems a year after my travels I’m still going through photos. Life just got busy and I got distracted. So, tracking back in time, I needed to get to Calais from Belgium because I had to catch the Dover ferry to England and then get to Brighton for the British Fantasy Convention, held at the beginning of October. 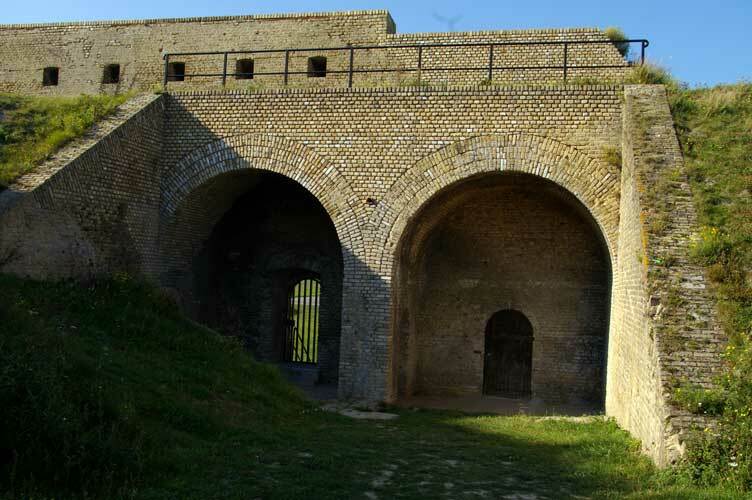 The bunker in Calais. I’m not sure if it’s from the first or second World Wars. There were ferries closer to where I was in Belgium but it turned out none took foot passengers except for the Dover ferry. By this time, I was getting a cold and my feet were actually blistered from walking so much. I was a bit tired. The train to Dover from Ghent took 2-3 hours with a stop in Lille. It was a beautiful clear day in Calais, a fairly modern looking city but then it was probably bombed a fair amount during WWII. I stayed in the Hotel Richelieu, a very short walk from the station and run by a man who was slowly renovating each suite. Breakfast was included but declined as I needed to get up early the next morning to catch the ferry. 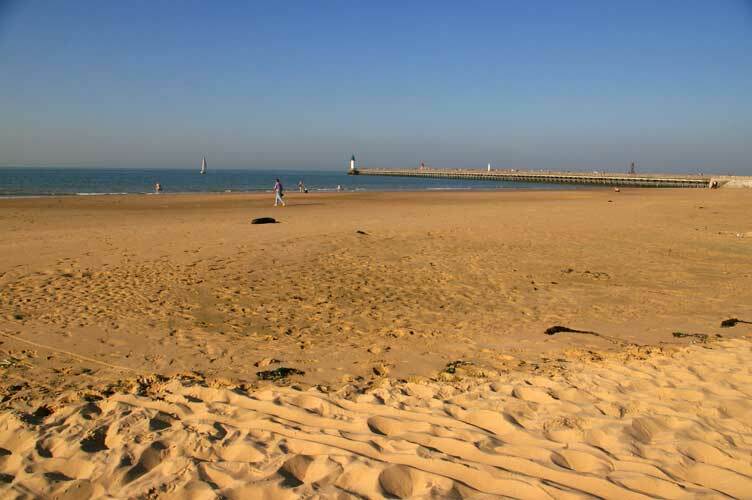 Calais’ warm, brown sand beach. I wandered down to the beach, passing a bunker that I explored. It was sealed but obviously left over from the war. The beach itself was this amazing very fine-grain beige sand. I took my shoes off and walked into the water to soothe my feet. I wandered after that, taking a few pictures, then stopped in a cafe. I thought, because I was in France I would find cider, and using my very sad French, prefacing it first with “My French is not very good” (in French) I asked, “Vous avez cidre de pomme?” My answer was “quoi?” by a rather rude waiter (who tried his best to ignore me). I repeated and he said non so I ordered a glass of red wine. When it came time to pay the bill, and I didn’t understand what he said, he reverted to English. Later, when I wandered into a chocolate shop and repeated the experience I began to suspect that the people of Calais won’t speak English if they can get away with it. With ferries from England you can expect that they deal with English daily and maybe it’s a resistance to assimilation or the belief, when in France do as the French. I at least tried but they certainly didn’t give much for trying. 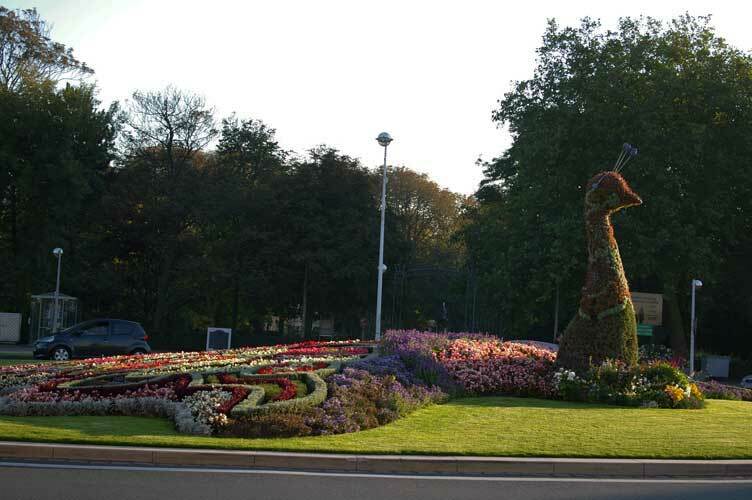 The very large floral peacock on the main street in Calais. I didn’t have time or energy to explore farther afield but Calais seems a small resort town. I found what I thought was city hall, with a lovely floral garden and a foliate peacock across the way. That evening I went to Le Restaurant Ancienne and had sea bream with balsamic rucola (arugula), tomatoes, bell peppers and mashed potatoes. Dessert was creme brulee with caramelized strawberries and lemon. It was creamy and all very good but too much for me to finish. In Europe so far, I found that unless you were ordering a bottle of wine, restaurants only have one choice by the glass. The next morning I took a taxi to the ferry dock. I’m very glad I did as it turned out to be a very long and winding way. I would probably have missed the ferry and been exhausted. It didn’t cost that much for a taxi and I had a pleasant enough journey chatting with a man and his sons. The ferry ride was about three hours and for some reason, none of the sites seemed to have given an accurate time for the crossing. I got to see the white cliffs of Dover but had no time to dally on the other side and made my way to Brighton. The only ferry that takes foot passengers is in Calais. The Belgian ferries are only for cars. Clicking on the above picture will take you to the web album. Bruges (Brugge) was by far my favorite of the three places, including Antwerp and Ghent, which I visited in Belgium. I actually took the tram or bus from Ghent to Bruges, a fairly short trip. The weather was perfect and quite warm and while I found the many brick buildings of Bruges and the canals to be particularly picturesque the smell wafting out of the sewers was fetid. Luckily, within a few feet the stink would dissipate. I think I counted at least a dozen chocolate shops in the town center, but of course by the end of the day when I wanted to buy some I couldn’t find my way back or find any. I’m notoriously directionally challenged and old medieval lanes and streets tend to wend their way here and there and around buildings and canals. Given that, the area wasn’t large and I could always find my way back with a bit of exploration. Brugge canals have building buttressing the water and red trim to compliment the blue of the sky. Belgium doesn’t have a museum/gallery pass like Holland does. However there was a day pass for several museums and galleries and even for a day trip it saved me money. It’s always good to ask at the train stations, tourist centers or the first gallery you go to (as I did in Brugge) if such a thing exists. My pass was for three days but at 15 Euros even for one day, I saved money. Arenthuis is an 18th century mansion that housed contemporary art and works but the Bruges artist Frank Brangwyn. His paintings were bold and colorful and I quite enjoyed the style. He had also designed furniture and other items. Bruggemuseum is actually a collection of historic buildings. I wandered into some of them and missed others. It was only one day after all and many things close at 5 pm including shops. One of my favorites was the Basilica of the Holy Blood, a small chapel up on the second floor of a gothic building. It was beautiful both in simplicity and elaborateness. A gothic cathedral, it was small, with vaulted wood ceilings and every inch of wall and ceiling painted in patterns and colors. I loved it. It had such a great sense of peace as well. Somewhere, tucked away is a reliquary with an old rag supposedly covered in the blood of Christ. Details of the Basilica of the Holy Blood. Every inch of the interior was painted. Because I will still battling travel ills and a cold I got started later in the day and wandered the streets, missing some of the historical buildings. In a way, after seeing so many churches over two weeks it was fine to miss a few. However, if I hadn’t needed to get to Brighton for the British Fantasy convention I would have stayed an extra day to explore Brugge longer. By dusk I was trying to find a restaurant to eat at but they were tucked away on different streets so it took me a bit to find one. The place I entered was packed, with warm brick walls and a sweating owner trying to keep everyone seated. I don’t remember its name but I had begun to learn that the portions were quite large in Belgium so I ordered an appetizer and dessert, with a couple of glasses of wine. Beside me this couple had ordered mussels and the very large metal mixing bowl they threw their shells into was at least 16-20 inches across. My meal filled me nicely. I was in Brugge at the end of September, as evidenced by the turning leaves with the weather at about 25-27 degrees, unusually warm for that time of year. The night came on early and I headed back to Ghent where I would leave for Calais the next day. Clicking on the above picture will take you to the photo album. After two days in Antwerp, I took a train to Ghent. I stayed at Het Rommelwater and Renee had sent me directions and which station to disembark from. It was a short walk down the major road, where the street curved away. Like Holland, Belgium has many tall narrow buildings and I lugged my heavy suitcase up to the second floor. The room was a double (since renovations were underway outside of the single room), and had a little sitting area and table. Outside the room was a fridge, toaster and microwave for use by the guests. Like many guesthouses, there were maps and information on the city. A view from the belfort overlooking Ghent. I probably could have taken a bus but I walked to the city center along one of the canals in about twenty minutes. The weather was excellent so I didn’t mind the walk and a chance to take pictures. It looked like Ghent was going through a major reconstruction of some of its oldest buildings, which included the town hall, a mixture of several centuries’ architecture. Some places you cannot get into unless you take a tour so I signed up to see inside the stadhuis. I was the only non-Dutch speaker (Belgians speak French and/or Dutch but it’s called Flemish) so I ended up getting a private tour. This was awesome because I could ask all the questions I liked. The hall is a blend of gothic architecture at one end and the more plain 17th century architecture at the other. As buildings of civic fortitude it wasn’t magnificent but it was interesting. There was even a throne room, with red velvet, a canopy and some ostentation. Supposedly one of the round seats with a cushion on top actually hid a commode underneath. After the stadhuis I went over to the belfort, constructed in the 1300s. 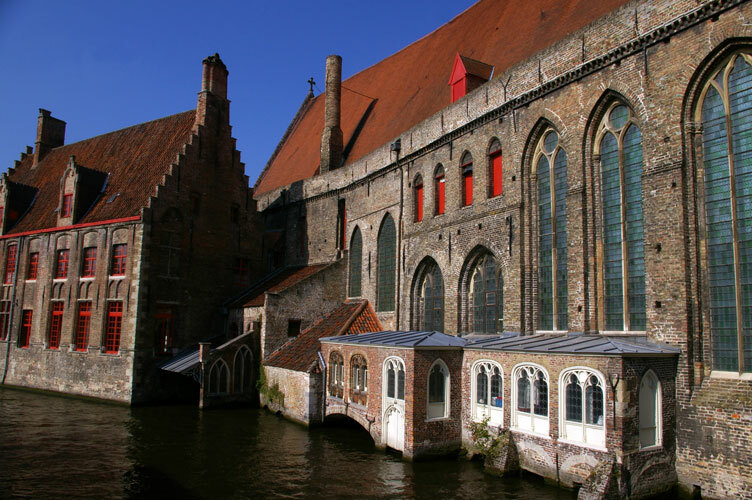 It also was the old cloth hall and this part of Belgium was known for its linen, wool and especially its lace. 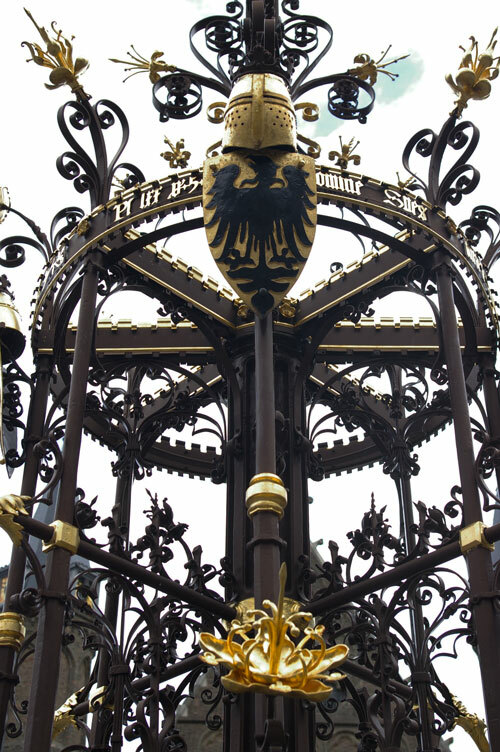 From the guildhall you could go up the clock tower or belfry, which houses at least four floors including many bells, a giant music box tumbler that controls the carillon bells, and the metal skeleton of the last gilded dragon that adorns the steeple. I decided to walk up all the stairs, that’s 366 or so, although there is an elevator that goes part way up. I stopped in at each floor to read the displays and let myself breathe. 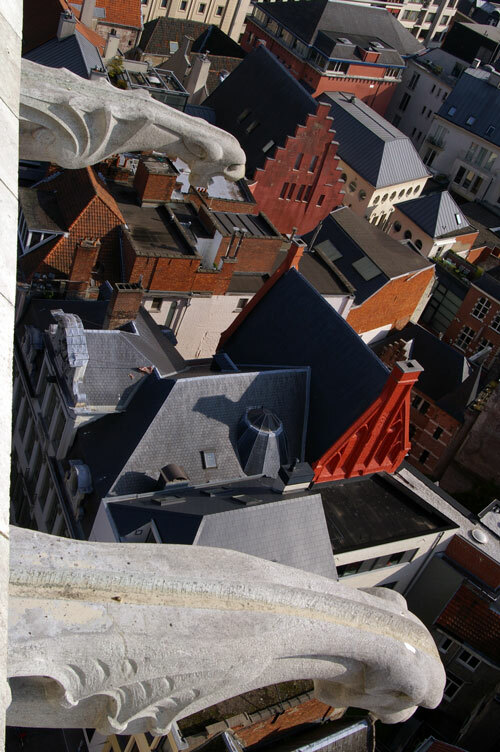 At the very top you can lookout over the heads of gargoyle waterspouts in 360 degrees. I took the elevator down, then wandered about the streets. 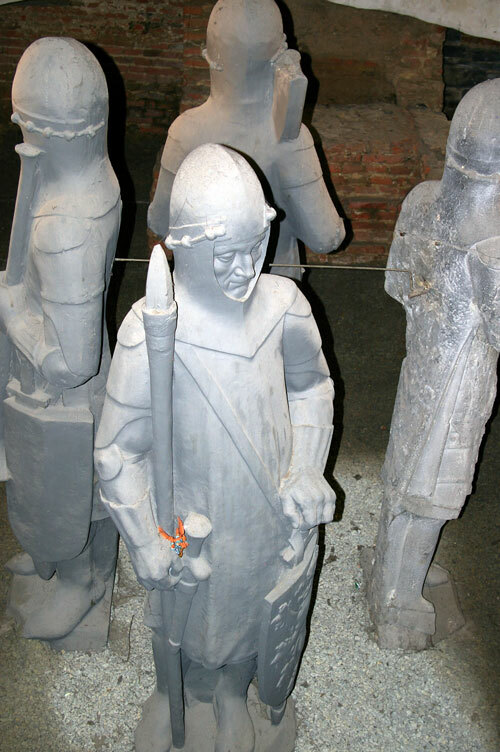 This medieval building had more modern whimsical statues. I did go into Saint Bavo cathedral but after the churches of Holland and Antwerp I was a little oversaturated and it was pretty tame in comparison. I found Het Gravensteen (meaning castle of the count), which was built in the 12th century. Unfortunately it was so late in the day that it was closed. The castle is not as large as a city block, though it looks impressive and has a tiny moat around it. I would have loved to see the inside as castles were few and far between in these areas. Still, the weather was lovely for wandering along the streets and canals. When it came time for dinner, there were many restaurants lining the canals. Ghent was my biggest food fail of the whole trip, which included England and Holland. One place was canopied, looking a little better class than some of the other places, and had this variety of shellfish including whelks and cockles. I’d never tried these so I walked in and asked for a table. They told me to take a seat outside and a waiter would be by. As I perused the menu I saw that you received a selection of shellfish for about 35 euros, definitely not cheap. But I waited and waited and waited. I don’t know if there was a prejudice over serving a single person, I wasn’t dressed well enough or the waiter just couldn’t see me sitting there but after 15 minutes with no service I left. 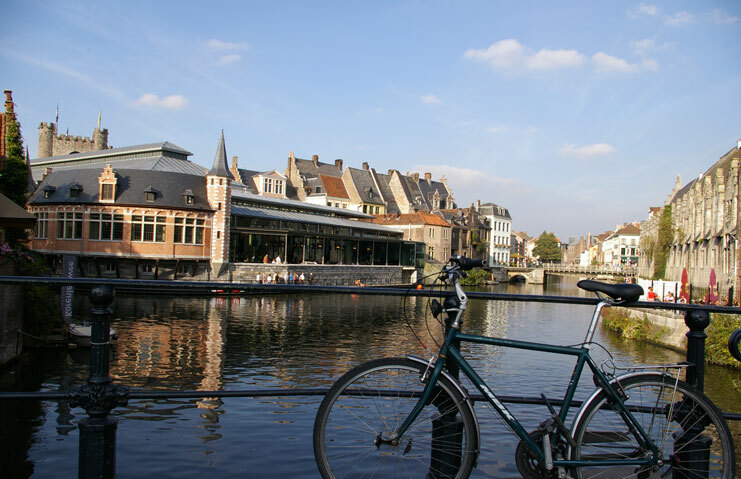 Ghent's canals are wider and fewer than those in Holland's cities. The next place I chose didn’t work because the menu was almost all fried food. By the time I found a place to eat it was dark. I sat outside since the weather was still fairly mild and decided to try the eel, which I’ve only had as sushi before. The eel was cut in chunks and deep friend, rather tasteless and greasy. It came with a salad and mediocre fries, which is saying something for a country that prides itself on its frites. I think the combination of all the construction around the cathedral and clock tower, the sad dining experience and some places being closed before I got to them, left me with little memory of Ghent. I was also coming down with a cold. The travel guide said you could do Belgium in two days (if you just hit the highlights) and Ghent could definitely be done in a day. These life size statues were in the bottom most level of the clocktower. Most of these memories are from my second day but in some cases it’s a mix of the two days in Antwerp. I was actually kind of glad that I decided not to go to Brussels. I was still feeling somewhat sick and my feet were starting to hurt from all the walking. I went to St. Paul’s Church and possibly St. James’ Church. In fact, I’m not sure anymore if I did go to the second one, and it’s possible one of these churches didn’t allow pictures inside. St. Paul’s church had the statues of calvary outside, with rough hewn stones forming a grotto. I couldn’t tell if it was of recent or older centuries but while St. Paul’s was of an earlier era, the calvary statues were added in the early 1800s I believe. It was in one of these many cathedrals, where I listened to piped in organ music, looking at the patterns of light through stained glass, staring at carved wooden and stone statues and admiring triptychs by the masters that I thought, even if a person wasn’t religious they would be hard-pressed to not feel moved by all the fantastic accomplishments and beauty of humanity. Shops opened late on Monday because, as one person told me, people might be hung over still. 🙂 I wandered around the old area and noticed there were enough chocolate, frites and waffle shops. The Belgians love their chocolate like the Dutch love their meat. While I still had to work at dodging bicyclists and nearly got run over twice; it’s not really clear who has the right of way so I always tried to look in all directions. I think the order is first trams, then cars, then bikes then pedestrians, almost reversed from Canada. Most of the street corners have fewer lights and cars and trams drive down the same narrow streets. At one point the tram was stuck because someone had parked too close to the track. The tram drivers kept ringing the bell for about ten minutes till the guy ran back and moved his car. This was a great lunch with three large pieces of halibut. About 17 euros including wine. More people smoke than I’m used to but it didn’t seem as prevalent as Holland, however no matter where I went I seemed to smell cigarettes and people can sit on restaurant patios and smoke. 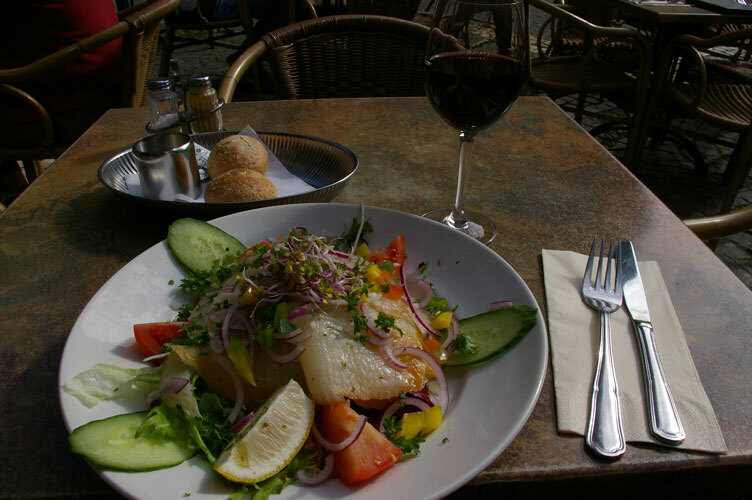 I had a smoked halibut salad for lunch, which was quite large, making up for the 15 euros I paid. The portions are more than I’m used to. Unless ordering a bottle of wine, it was only one type of house wine so there was no point in asking for a type. At 3.5 euros a glass it was more reasonable than the water. Chocolate isn’t that cheap but the frites are, which come with an array of flavored mayo sauces. Being Canadian I’m used to dunking my fries in flavored mayo so it wasn’t that odd. I wandered into a few stores and found shoes really expensive as well, which curtailed me buying any. St. Paul's interior. 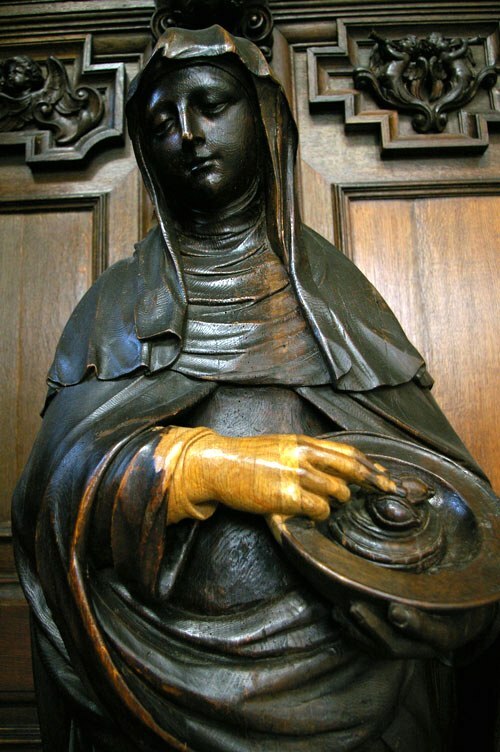 This life size statue of Mary (holding a plate with eyes) has had the stain rubbed off of her hand from centuries of worshippers. I actually wandered along the Scheldt River the day before, which is one of the biggest shipping ports in Europe. There is a plague commemorating Canadian troops liberating the city in WWII, and a couple of statues. Walking farther along is Het Steen, which means the rock. It’s the oldest fortification in Antwerp and is rather small when you think of it as a castle. There wasn’t a lot to see as it was locked up (probably considered a museum) but it has a good imposing look to it. I ran into an Egyptian-Belgian and he insisted in taking me to the best waffle shop where I had a waffle with chocolate sauce. I’m actually more used to waffles being like quilted pancakes but this was so airy that it was easy to eat and tasty. Down near my bed and breakfast was an area of the city that housed Art Nouveau buildings. While this man would have loved to show me around for several hours, the light was going to be gone soon and I love Art Nouveau. I made my way to the area and took some pictures of the truly amazing architecture from about 1910-1920. 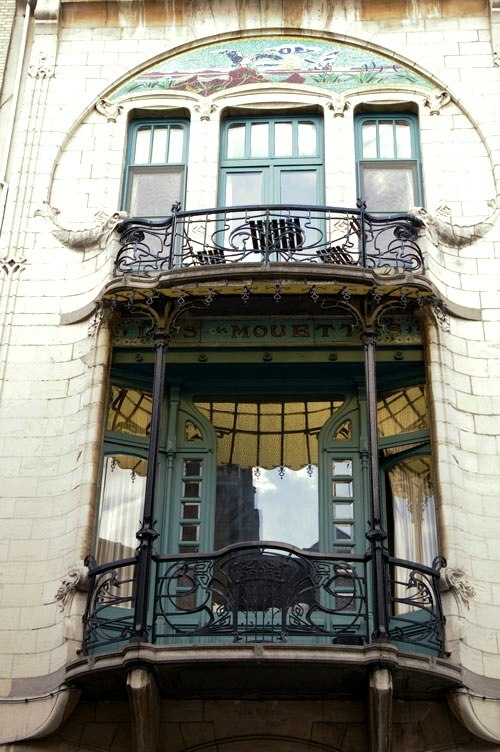 One sample of a fantastic Art Nouveau balcony and architecture. and said that was fine, I knew that. (In fact, I saw a fair larger gay population in Antwerp than I did in Amsterdam.) His friends were getting mad at him for not talking with them and then at one point, the one guy (two were from Hungary) whose English wasn’t that good started yelling at me and blaming me for all the “horrible” things Canada was doing to the Indians. I said it wasn’t that simple or black and white and that yes there were good and bad things done. He kept at me and I asked, “If your brother killed someone, would you be guilty?” That didn’t deter him so finally I lost it and retorted, “Fine let’s look at what the Hungarian Magyars did to the Gypsies.” He got more worked up yelling and walking around that the two women were telling him to shut up in Belgian. The bartender came out and said he was going to call the police. I was bewildered. Here were some of the friendliest people I’d met in my travels and some of the nastiest all at once. I couldn’t take the ranting so I thanked those who had been nice and went back to my lodgings. That one incident was bizarre but I’d go back to Antwerp again because I certainly didn’t see it all. Click on the top picture if you wish to see more of Den Bosch. 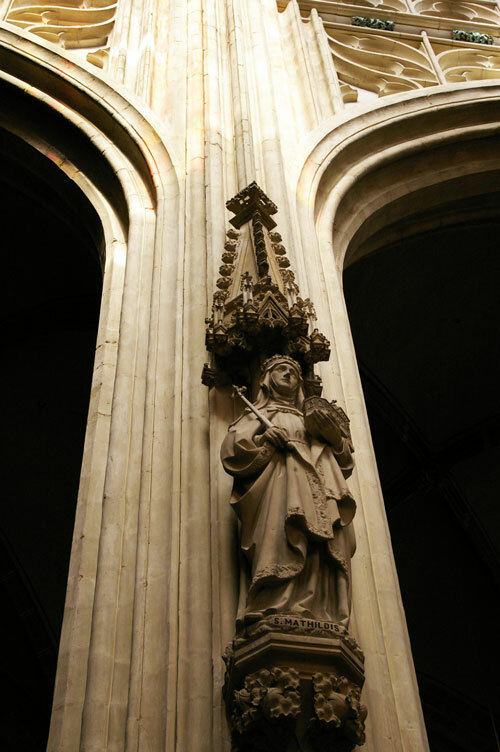 The interior has many sculptures of the saints. I spent two days hanging around Den Bosch, and really I could have spent longer. 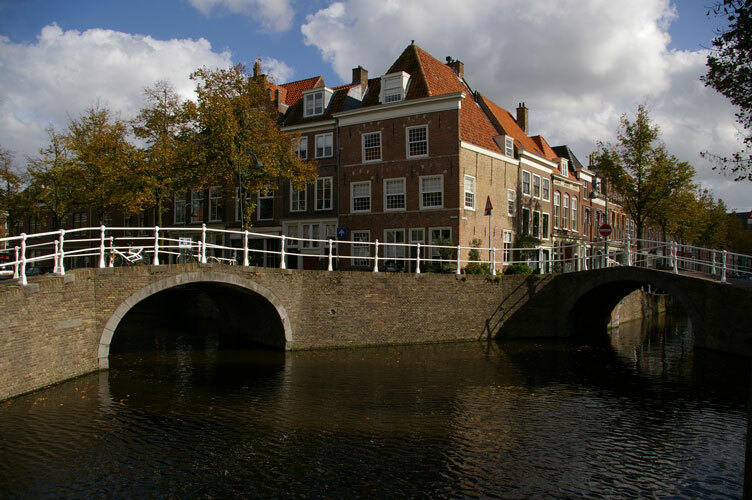 It’s a beautiful pastoral town with many interesting shops, a town market square and the best gothic cathedral (in Brabantian style) I saw in Holland. St. John’s Cathedral (Sint Jan’s Kathedraal) began its life in 1220, and unlike the churches of northern Holland, it never fell under the hand of the Protestant Reformation. Thus it is covered in statuary on the exterior, as well as a plethora of saints on the inside. I was told I was lucky because the church had been under scaffolding for the last ten years as they did major repairs. There was an educational display inside that depicted some of the restoration techniques used to preserve and shore up the water porous stone. These endeavors are extremely expensive, can take years of work and will be needed again in decades to come. I’m sure it’s not the biggest cathedral in Europe by St. John’s was picturesque. The exterior is festooned in angels, gargoyles and workers. Each flying buttress has craftsmen sitting on the struts all the way up. 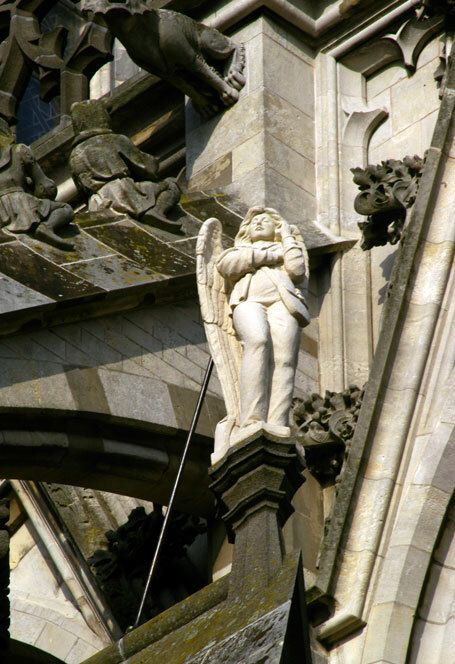 Every pinnacle has a saint or an angel and one angel, replacing one of a few that fell to disrepair, is, when you look closely, standing in pants with a pouch/purse on her hip. She is holding something to her ear and I was told that they asked permission of the bishop to put up a modern angel. She holds a cell phone, but there is only one number because it’s a direct line to heaven. The interior has some very good triptychs, and some are unusual in that they are part panel paintings and part carved panels. 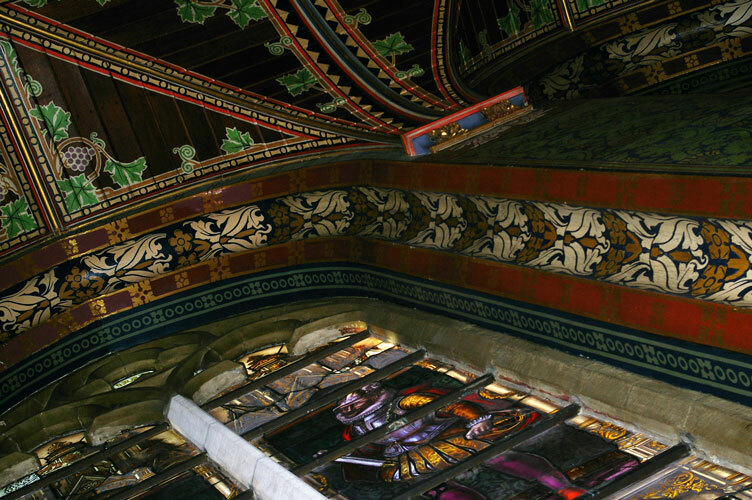 The stained glass sheds rainbows of light on the interior walls and many of those are still painted in frescos. Others have been renovated to bear the painting of centuries past and the use of color on the stone walls is something I had never considered in a cathedral before. The effect is quite stunning. 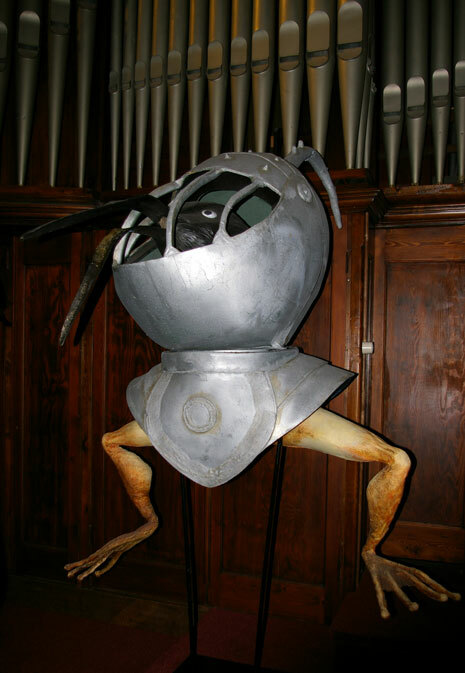 Besides the cathedral, which is well worth a few visits, I went to the Hieronymus Bosch museum. it’s in a church that I think was designed in the 1800s but was never completed due to lack of funding. It was taken over to house information and displays on Den Bosch’s most famous son. His “Garden of Earthly Delights” is probably one of the more bizarre paintings of the Middle Ages. Bosch was fervently religious but his creatures and depictions of events and sins were right out of a drugged up fever dream. What an imagination. Interestingly, there is not one Bosch painting in Holland. They all reside in Spain. At the time Holland (or that part that has Bosch’s paintings) was under Spanish occupation and the Spanish loved his works well enough to transport them back to the homeland. Therefore there are replicas of his paintings but with informative displays as well as the sculptures. I also realize now that I lost some pictures because there was an art show on the main floor by a contemporary artist inspired by Bosch. In the basement was a setup of what the artist’s life might have been like, along with displays and mannequins. There were interesting shops and lovely cobblestoned streets. The market on the weekend was jam packed with goods to buy from food to clothing. It was hard to walk through because there were so many people and it was a lovely day. I can see why people would get away to Den Bosch and if I’m in Holland again, I’m definitely coming back. 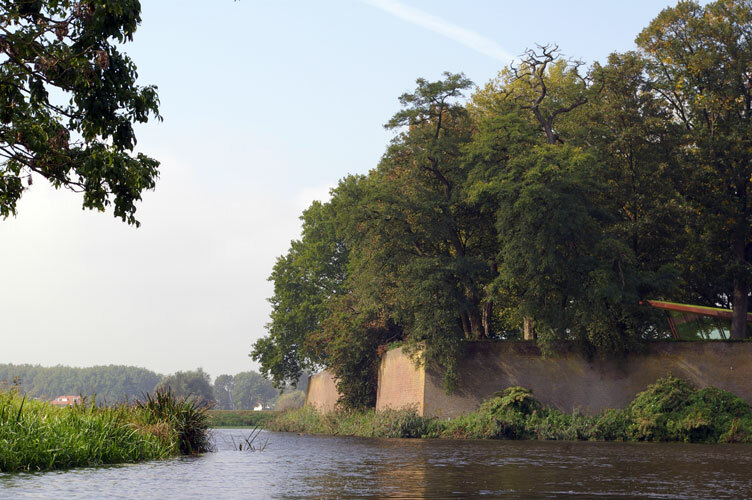 Den Bosch's ramparts and river served as a nearly impregnable fortress. My last stop of four cities in Holland was Den Bosch. The full name is ‘s-Hertogenbosch and I think you have to be Dutch to pronounce it. Most people call it Den Bosch now and pronunciation seemed to differ between “den bos” and “den bosh”. Den Bosch is south of Utrecht and north of Eindhoven. It’s not large but considered a place to get away “to”. I probably would have missed it completely if it wasn’t that speculative writer and editor Jetse de Vries lives there and I emailed him to meet up. Once I started reading about Den Bosch it sounded interesting enough that I stayed for two nights, couch surfing with Will. Jetse and I played a bit of tag at the train station, trying to find each other. Once we met I put my luggage in a locker and off we went to a cafe where Jetse introduced me to Den Bosch’s own claim to fame, the Boschenballen. 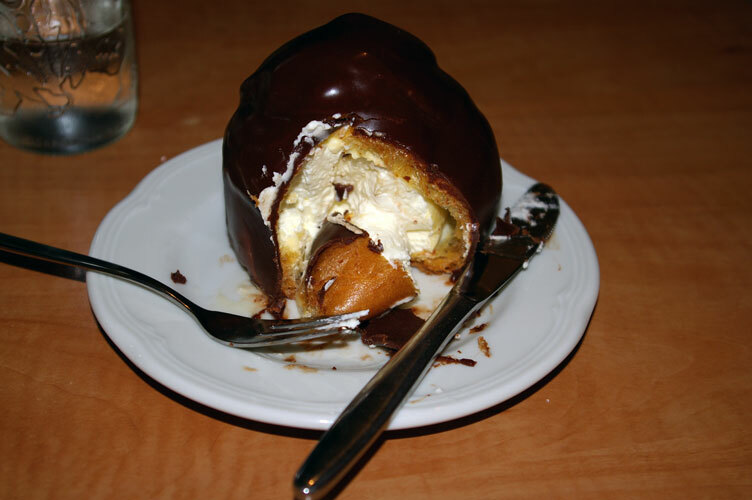 If you’ve ever seen a profiterole (cream puff), imagine one bigger than your fist, covered in yummy dark chocolate and inflated with creamy goodness. I wasn’t sure I could eat the whole thing (and shhh, but I’m allergic to dairy) but I took a bite and another and somehow managed to polish it off. I certainly didn’t need lunch till much later. A very larg cannon is housed in the structure atop the walls built in the 15th century. By the 1500s it turns out Den Bosch was once the true mercantile center of Holland, with three rivers (Dommel, Aa and Maas) converging nearby. 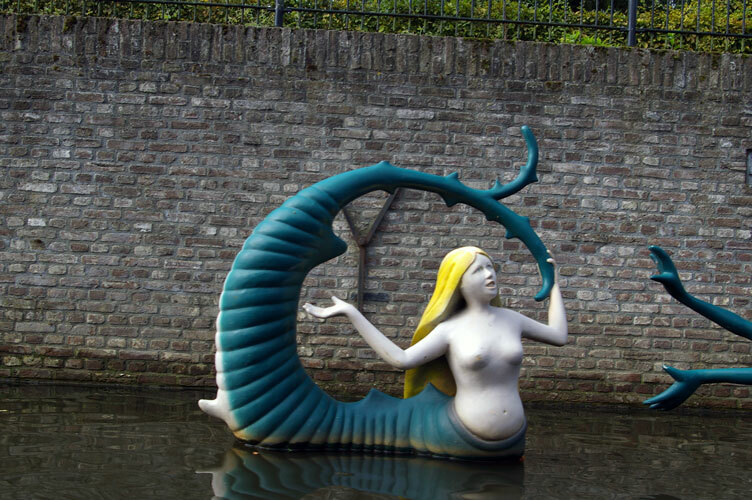 The Dutch are also masters of the water ways and trade came and went by land and water. It was second in population only to Utrecht. 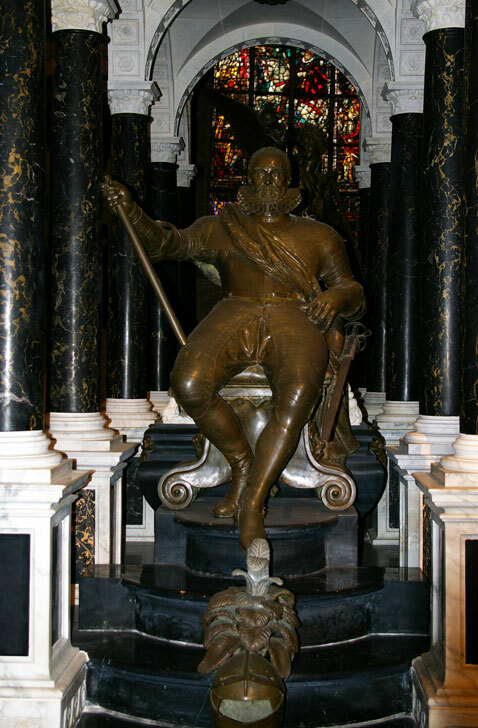 ‘S-Hertogenbosch means Duke’s Forest and the original Duke was Henry I, Duke of Brabant. 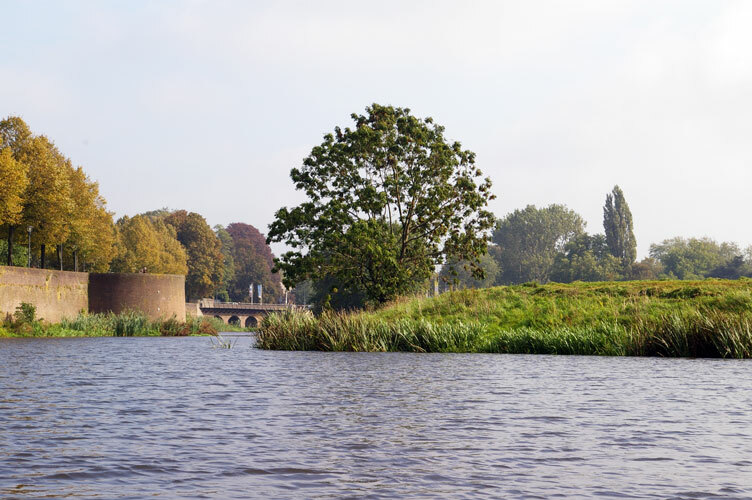 Over the centuries, with fortifications increasing, Den Bosch was considered impregnable and nicknamed the Marsh Dragon. They had built a moat from the rivers and water ways; if invading forces came near, they flooded the lands around. Too deep to walk through and too shallow to put a ship on, the city’s defense’s held strong. To get over one of the many bodies of water, there is a hand crank raft to take people across. That is, until 1629 when Frederik Hendrik of Orange, using Dutch ingenuity and a goodly portion of purloined coins from a Spanish armada, built a dyke around the city with windmills and then pumped out all of the water. He managed to break through the one weak spot in the wall’s defenses and then rebuilt that section making it stronger. The ramparts still stand and are integral to holding back the waters. Den Bosch is considered one of the better fortress cities in Holland. A nature reserve now borders one side of the town, giving great pastoral views and nature walks. 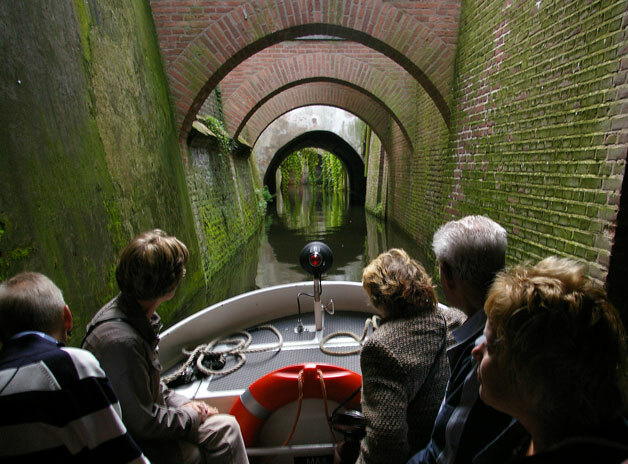 The underground canal tours are lovely and a great way to see the city. Jetse had booked a canal tour and Den Bosch’s canals are unique in Holland because they’re mostly covered, unlike the open canals elsewhere. While the tour was in Dutch, Jetse was able to tell me much about the rich history of this small town. It seems people were not allowed to build outside the wall and as the city became more crowded they actually built over the canals. At one point the city was going to pave over the canals but instead the government made it a protected townscape, preserving the historical ramparts and the canals. Boschian fun on the canal. The weather was perfect in late September, around 25-27 degrees Celsius. The tour went under the city and then outside around the ramparts. It ended with ducking into a darkened alcove where they showed a short film on Hieronymus Bosch, the city’s most famous painted. The water level was relatively high so we really did have to duck. 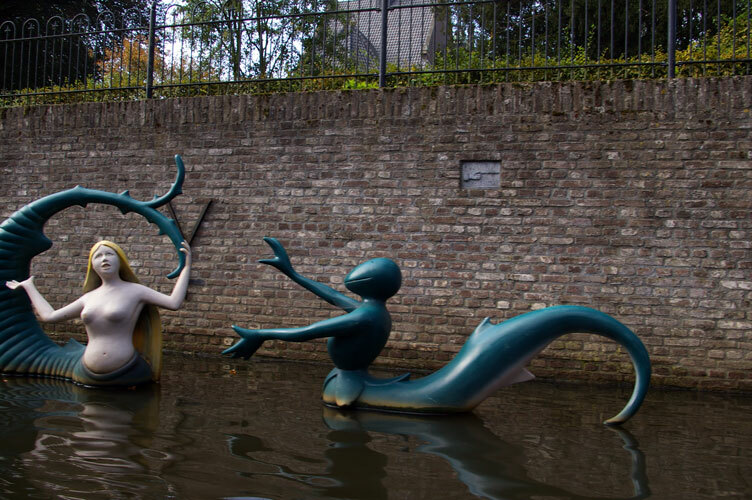 And along the canals were large sculptures of some of Bosch’s strange creations. Den Bosch's canals were very beautiful. Even without understanding Dutch the tour was worth it for the sheer beauty and scenery. The following day I took a walk outside the city walls and got to see Den Bosch from afar. Of the cities I visited Den Bosch definitely felt the most pastoral, because of the flat fields and the winding river around it. In my next post I’ll talk more about the cathedral and other aspects but it was definitely worth the visit. I’ll also have the full album posted once Picassa stops being persnickety. Known as The Hague to us Westerners, I prefer the Dutch version of Den Haag. 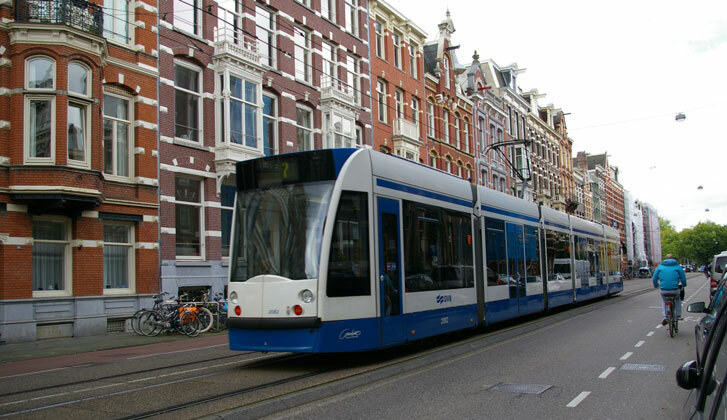 While staying in Delft, I decided to go to Den Haag, thinking I’d need to catch a train but from my B&B in Delft it was an easy 20-minute tram ride. Very convenient. The weather, for late September, was off and on rainy but overall very nice and warm. 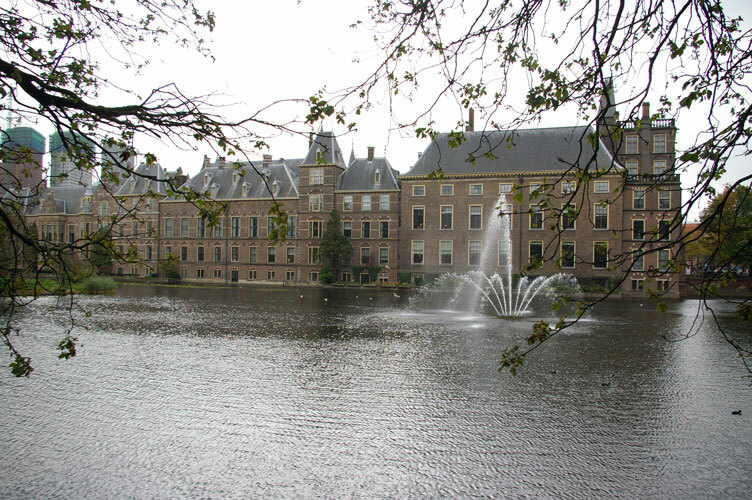 I arrived close enough to the Binnenhof, the seat of the Dutch parliament to walk around the central area. I’m not sure how interested I would have been in the Binnenhof’s interior but as it was there were no tours that day. There was a lovely and ornately wrought iron and gilt fountain and the details on the buildings, some of the dating to the 15th century. Mauritshuis was close by and I took it in. Here is where you would see Johannes Vermeer’s Girl with the Pearl Earring among others. In fact the building was full of paintings in various rooms. Once the home of Prince John-Maurice, there are four major rooms on two floors and each has a fireplace and paintings on all walls, There are works by Holbein, Potter, Brueghal, Rembrandt, Steen , Hals and many others. Of course in all the best galleries you can’t take pictures so you absorb as much as you can and hope you can retain some of it. The benefit of seeing the actual painting as opposed to a picture in a book is that you can appreciate how the light actually works with the paint, as well as its thickness, the texture and the details. The Dutch were masters of shipping and masters of the painted canvas in the 17th and 18th centuries. for something he had just said. It seems that there were different types of torture and only some of it was actually considered torture. This was done in the lower cells, where as the room depicted in my pictures was for those who were either to be executed or have information extricated from them. There was a gallery of art too so it was a rather full day of paintings. This took up my day in The Hague and I went back to Delft for dinner and to wander along the pretty canals. So in truth I saw a very small section of Den Haag, which only took up a few blocks. Still, that was rather enough for one day. These posts on Europe will come sporadically as I have to digitally fix the photos for web viewing and it’s a busy season for me right now. To view my full album of Delft, click the first picture. After Amsterdam, I took a train to Delft. I was stunned at the thousands of bikes at the station. I doubt if you gathered all the bikes in Vancouver that it would even equal this number. People commute by bike and train a lot. Because there had been some confusion in email as to the dates I was staying at the B&B I ended up doing last-minute couch surfing for my first night. Robbert had just finished his university and was still in a student apartment. He was helpful in giving me directions to get to his place and the next day into Delft central. He tried to teach me some Dutch and pronunciations but some forms are so foreign in English I just had problems getting them to sound close. Delft is small, when you’re looking at the medieval center. The next day I waited for the B&B owner to show. When she never did, I walked back to the tourist information center, always a good place to visit in any major city. Delft is small enough that they know of all the B&B’s. They tried calling both lines;when they couldn’t reach her they advised me to find someplace else. They ended up helping me find something in my price range (52 Euros) with someone who had just called in. 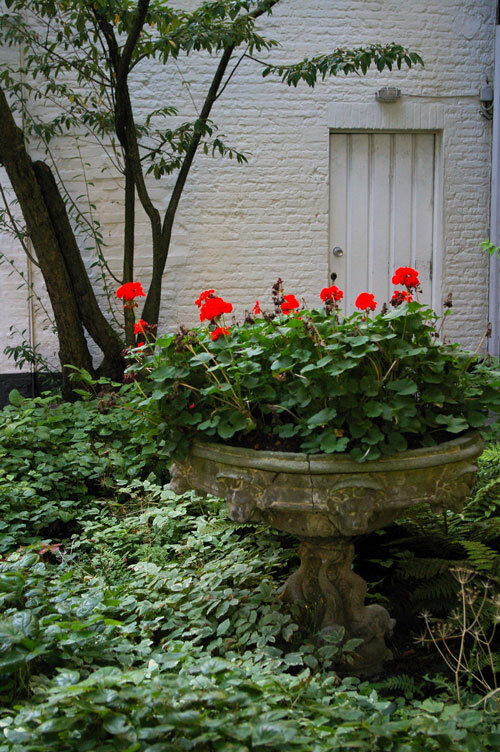 (98 Plantages–not available through any sites) was run by Liesbeth and was beautiful, clean, updated and close by. Liesbeth was an excellent host, giving me some ideas of restaurants to try and directions into Den Haag. Delft's picturesque canals have lilies and waterfowl. Delft was by far the prettiest town I visited in Holland, with Den Bosch a close second. The clean canals were picturesque with lily pads, swans and ducks. I even ran into a heron on the walkway beside one canal and got within two feet. The streets in the old town are cobblestone and shops line the streets. Delftware, that famous blue and white china, is not cheap but plentiful. I saw a guy on a scooter where the front design was the Delft blue and white. My first day after the screw-up with B&Bs left me with enough time to see the old and the new churches. (Throughout Holland and Belgium all shops close by 5. There is no evening shopping.) They were rather plain in the style of the no-fun Protestants who had pulled down statuary, removed paintings and white washed churches so that one would only concentrate on god’s glory, not on what humans had made. The one, ironic, concession to ostentation was the tomb of William of Orange, assassinated at the Prinsenhof (a convent he had taken over for a residence). William of Orange's tomb was so big that it was hard to photograph it all. The Dutch started later than some countries in instituting royalty and pretty much voted in the best merchant. At least that’s what I could tell . William’s grand tomb is the central design of the church. Before this date the royal family was buried in Breda but it was still under Spanish rule, so they began putting the royals in Delft, where they are entombed to this day (the dead ones that is). I was beginning to think after Amsterdam’s two and Delft’s churches that I was getting churched out, partly because they were rather bland in a gothic cathedral sort of way. The focus became the pillars, the gothic arches (which are impressive) and the black floors, carved with names, dates, arms and symbols of those who had passed on before. I wrote a rough set of poems here that I call triptych, after the style of religious paintings (that have three panels) used in many churches of the period. These will be polished at a later date. I took in the Prinsenhof on my third day. The bullet hole in the wall from William’s assassination is framed and stands out. There are works of art such as paintings, sculptures, silverware and Delftware for which the Dutch are famous, plus the story of William’s life. I believe the new church, starkly plain had many partitions that told the story of the royal family from its beginning to its present day. Like England, they have had a queen since WWII (and before). But reading about all the royals and who killed who or succeed whom was mind numbing after a while. I just enjoyed walking along the canals of Delft and would definitely go back here. Amsterdam was a place of contradictions. It was large, in terms of things to see and do, and small in terms of area, though I still managed to walk a good seven hours one day, getting lost on the wrong side of canals. It was cosmopolitan but kind of dirty because of so many people, the sidewalks and streets sporting numerous stains and dead gum and just general grime. I find that cities of this size end up with the group mentality issue. Like mob mentality, this massive city entity is one of mindless automatons, people all trying to get to where they’re going, without willing to move or adapt or politely let someone by. I cannot stand crowds for this reason; not because there are a lot of people but because there are a lot of people being mindless and self-absorbed and not trying to work with the whole. Drives me nuts. But…I maneuvered through the flight to the train and from the train station to the tram, even though the police gave me the wrong directions. There are plenty of trams and buses, and getting around is easy, as long as you watch out for bike lanes. I did blunder twice into a bike lane and nearly got smeared. Even so, the Dutch never swore at me (that I understood) and moved out of the way and I apologized profusely. Holland is the land of bicyclists, probably only second to China. 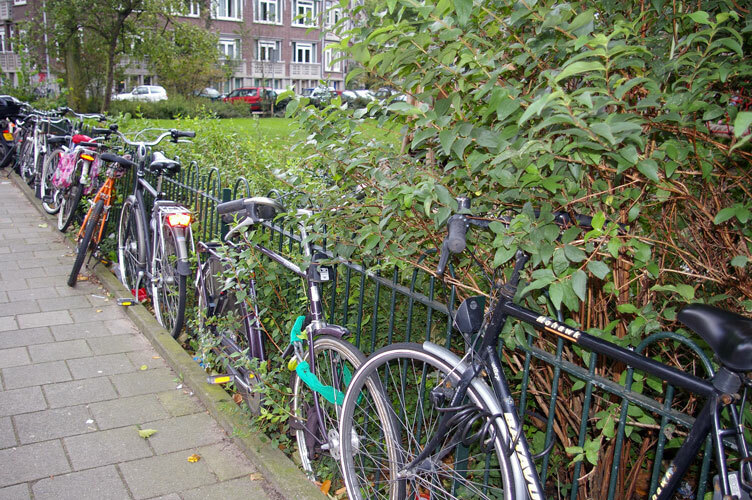 At train and tram stations I saw thousands of bikes parked in racks. On the narrow, medieval cobblestoned streets there are often trams, cars, scooters, bikes and pedestrians. A sidewalk might exist and might also be very narrow. A painted line in most cases is all that separates the bike lane from the sidewalk or road. And sometimes you just have to scoot around a parked car or someone moving items in and out of a building. The buildings, ranging in years from four-five centuries to recent, are narrow and tall. The windows are likewise very high. 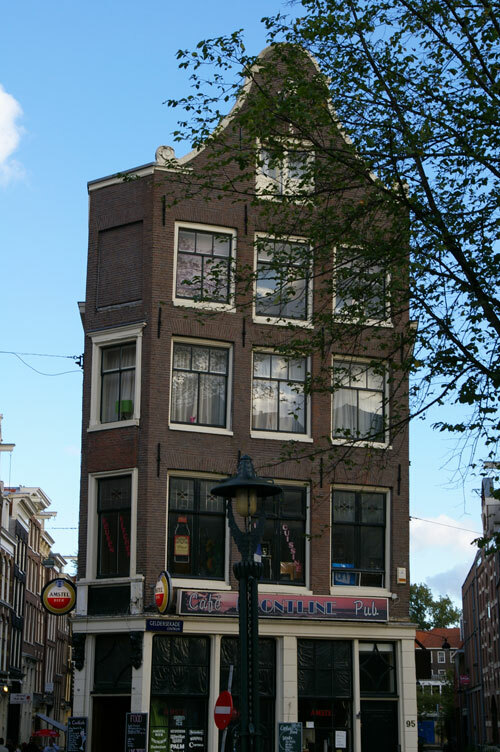 It seems back in the 16-17th centuries people were taxed by the width of their houses so they built up. Of course they were probably taxed on width because the land was reclaimed foot by painstaking foot from the sea, and most of Holland is below sea level. 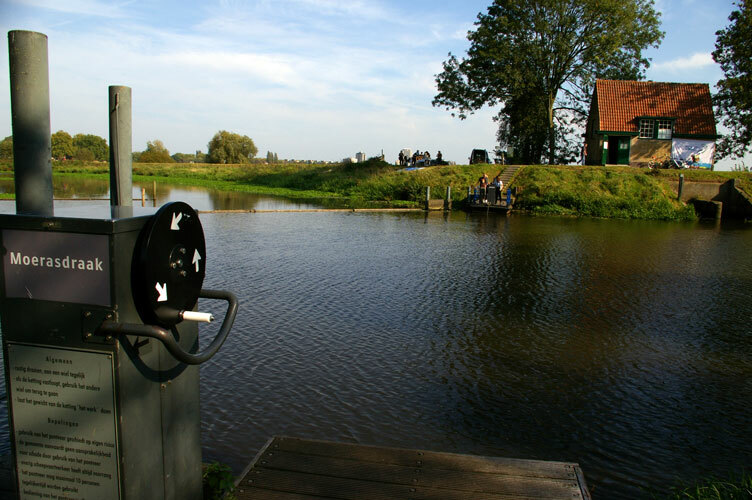 In fact, if I ever wanted to build anything near or on water I would hire a Dutch hydraulic engineer; they’ve been doing this for centuries. A good example of fancy gabling and the hook for moving items in through windows. As all the buildings are high and thin, it means there are many many narrow stairs, in fact too narrow to move furniture up. So they built hooks on the top end of the buildings by which to pulley items into the structure, and they’re still used to this day. Because of this way of moving furniture the buildings indeed lean out into the streets,because a perfectly perpendicular building would have its windows and facade smashed in a move. The buildings have several different types of gables, (step, bottle, etc.) which were popular for distinction as well as design at the top window. Before street numbers, shops had plaques that differentiated them or what they did or sold. And of course, everywhere there are canals. Before coming to Holland when I thought of canals I thought of Venice. How was I so ignorant? 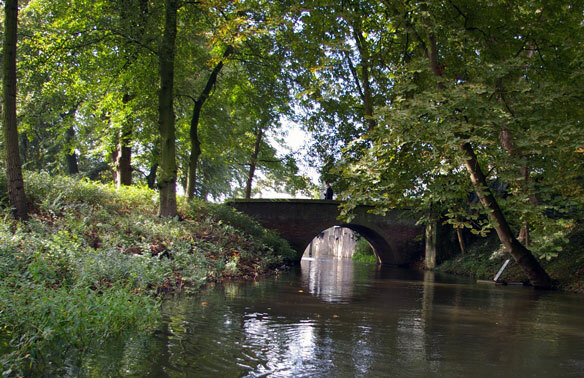 Holland is truly the land of canals, everywhere. Some areas have more than others but they are like the veins of the land. The land between the agricultural canals is called a polder and the Dutch manipulated every aspect of building below sea level. Not only do the canals provide irrigation, they also work as routes for delivery and transportation as well as being a way to maintain the land. Theywork as a bleed-off when the water levels rise and save many structures from flooding. Truly amazing when you think about it. 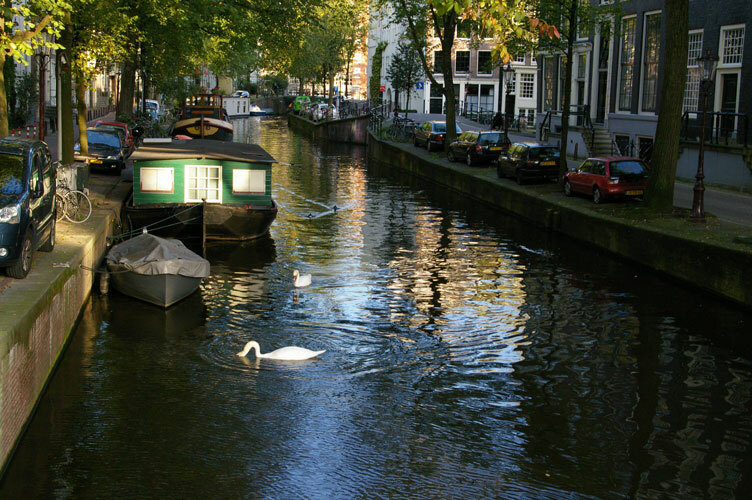 Now days, sewage is not dumped directly into the canals and they are pleasant, with numerous boat tours or houseboats. This building sat all by itself. These houseboats are often 100 years old. The streets are a mixture of cobblestones and modern paving, just as the buildings go from modern to five centuries old. There is not grid in a medieval aged city as the streets grew organically out of the center. 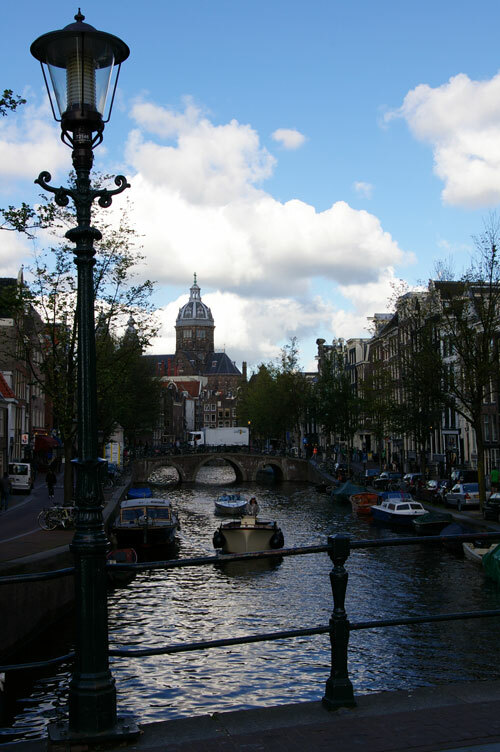 In this case the Amstel River played a role in forming Amsterdam’s streets, which horseshoe out. Wandering up and down these streets and canals and just looking at the buildings that people take for granted was as interesting to me as going into a historic cathedral or a museum. Canada’s oldest buildings might only be one and a half centuries old (especially the west coast), established by people moving into natural geographic areas and planning out their towns. The sheer age of European cities gives a much more organic and haphazard growth. 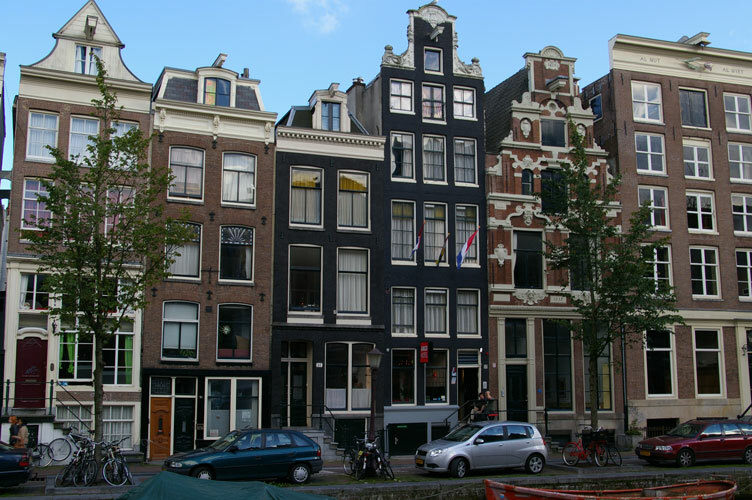 There is actually enough to talk about with Amsterdam that I’ll do a second post on some of the other historic aspects. My second day in England had me taking a train to Victoria Station to get to Stonehenge. Searching on the net for a map through Google showed a circuitous route of catching buses to the train, which would take about two hours. I asked the guest house instead, and in reality I walked about 15 minutes through Horley to the station. The one train ride was around 45 minutes. I wandered around Victoria Station, which has shops from groceries to clothing, restaurants and stands of flowers, chocolates, pastries, etc. It’s covered over, massive, with at least eight tracks for trains (not to mention the underground) and can be confusing to figure out. There are information booths and I liberally used them to get my bearings. 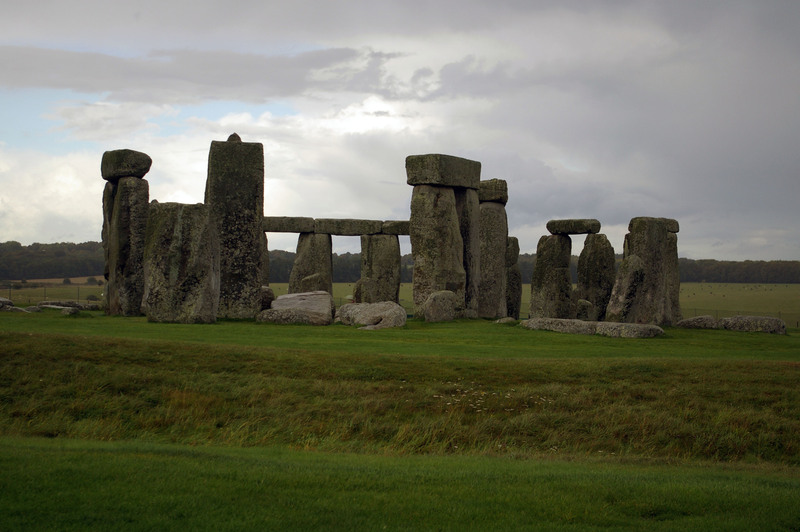 I had booked a tour to Stonehenge online before I left Canada, because I wouldn’t be driving. This was through Evans tours and cost about 25 pounds. Entry fee by itself is 7.50 pounds, but if you’re going to be in England long enough you can by a UK Heritage pass, which will save you entry fees on various castles, churches and other historical sites. I dislike guided tours overall but this one consisted of the ride and the entry fee. You were given an audio device land eft to your own devices. We had about an hour and a half at the site. And of course, it was raining, a lot. I watched sheets of rain and heavy black clouds, and stared out the window at the countryside as we took two hours to get there. The rain slowed somewhat by the time we arrived. I had bought a cheap, clear plastic poncho that I could throw over my jacket and day pack while I took pictures. 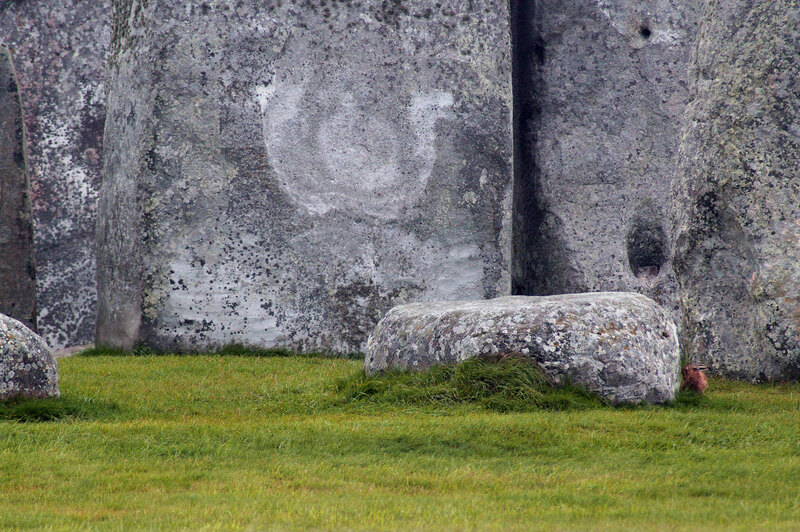 I put this one in because the reddish thing to the right of the ground stone is not a rabbit. What is it? The rain let up some and in a way it was a good thing. It added drama to the sky and cut down on the crowds. Yes there are about 100 people going by the stones at any one time. I debated putting pictures in of Stonehenge because there are so many out there, but I love the permutations of imagery. The stones are indeed smaller than you would expect but still majestic in their way. As you walk around the henge, the path slopes gently down and what is believed to be the entry to the stones puts them on a rise and makes them look bigger, tower above the horizon. 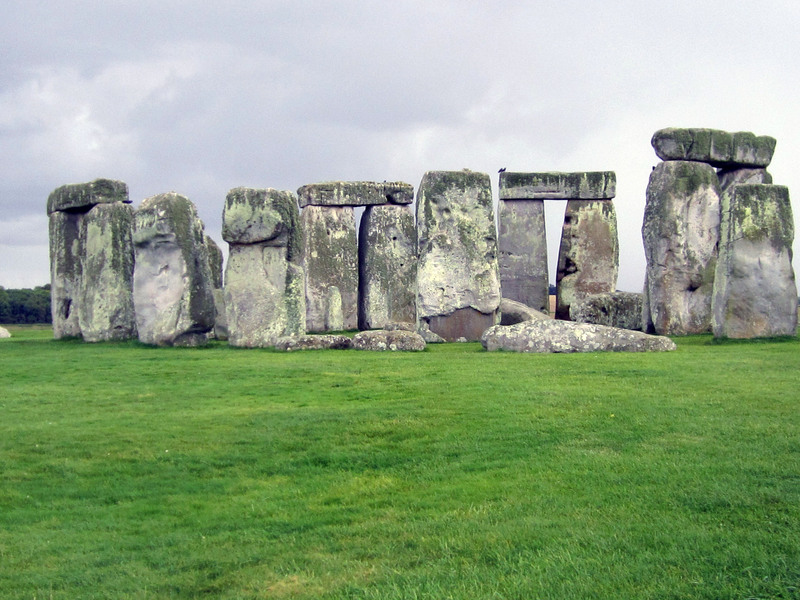 Many stones went missing over the centuries as they were taken for other construction. Some toppled. Debate continues as to the henge’s use but it indeed seems to have been a calendar that marked the passing of the summer solstice, just as Newgrange in Ireland marks the winter solstice. The are over 90 types of lichen that have been identified on the stones and some of them found nowhere else. As fall comes along and the rains descend, I’ve been told that the stones turn more reddish because of the ores in their composition. In some of these pictures they’re just starting to turn red. But the stones have a variety of color; grey, black, white, green, beige, brown and shades in between. I’m fascinated by the architecture of humans and by the textures of stones. Some people will not find 50 some pictures of Stonehenge interesting but for me it’s both sculptural as art, and a mystery as to purpose. I’m glad I included Stonehenge in my trip.